ugh, that is disgusting. it was probably a parent who took the picture. The origins of swine flu revealed. 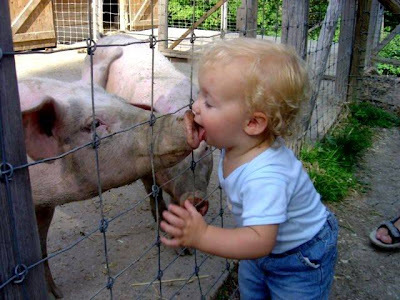 Real talk, if my kid licked a pig's snout I would leave him right there. Nasty but I found myself chuckling anyway... The child looks really content. my first thought was really. babies and their mouths. Talk about wash his mouth out with soap! Okay. I thought it was kinda cute. Egypt ordered over 300,000 pigs slaughtered for fear of an outbreak. Muslims don't even eat pork! And only 10% of the population is Christian. No bacon for them.